* Entire journey: 3 hours from Hanoi+ 2 hours on highway with peaceful rice-field & plantation scenery, only cars, not any bike allowed. + 1 hour on beautiful coastal road & through Cat Ba National Park path. * Trekking (3D2N): YES * Entire journey: 4 hours from Hanoi+ 4 hours through 8 cities & towns with traffic lights & traffic jam. + Crowded city roads with trucks, containers, cars & bikes. 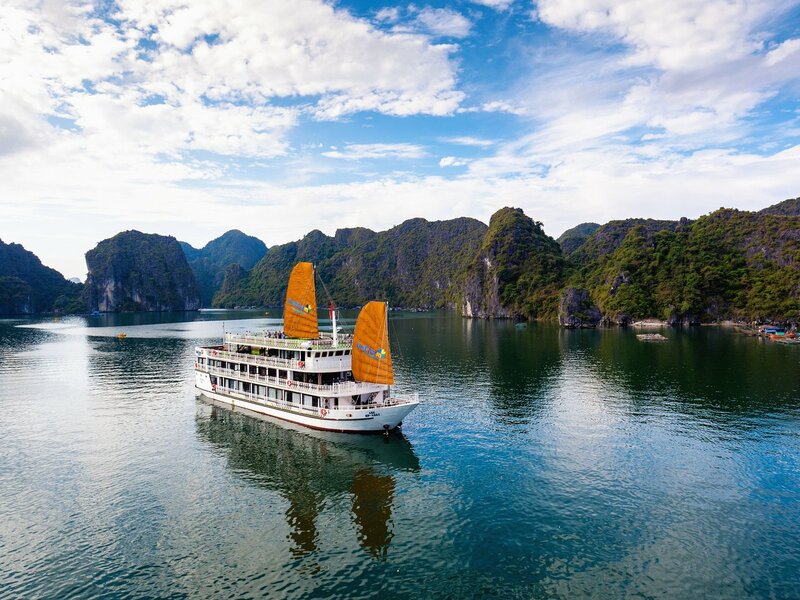 * 500 tourist boats on Halong Bay from front side. Package Tour & Transportation from/back Hanoi. Professional English Speaking Guide & Entrance fee. Biking, Swimming, Kayaking, Snorkeling, Trekking, Cooking class. Meals on board: Morning snack, Lunch, Brunch, Dinner. Day 02: Cat Ba Island activities: Biking in Viet Hai village – Trekking in Cat Ba National Park and Kayaking in Lan Ha bay. 12:00 – 12:30 arrival back, say goodbye to the bay and disembark UniCharm Cruise for another drive on the free-way AH5B back to Hanoi.